A comprehensive voice and speech recognition program to use your voice for command & control of your computer and dictation. Reduce or eliminate mouse clicks or keyboard input. Open Web sites, documents, or programs using your voice. Perform navigation and editing functions simply by speaking. Dictate letters, memos, and email messages. Begin talking to your PC now using your voice. Say-Now voice features a rich set of predefined voice commands and is based on the latest speech technologies from Microsoft. 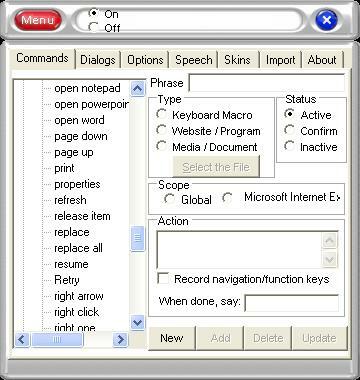 Import hundreds of commands for Microsoft Office and other Windows programs and games. Create your own commands for the software that you use. The program includes synthesized speech prompts and audio feedback. A variety of graphic application skins and options let you customize your Say-Now voice experience. Say-Now voice includes integrated text-to-speech capabilities enabling the computer to have a voice to read websites, documents, and email messages to you.